Mid-century modern design style has survived many decades due to its clean, sleek look. Today, it is referred to as just modern design, but this style has been around since as early as 1933. There are a few simple but essential tricks that have kept this design style around for so long. 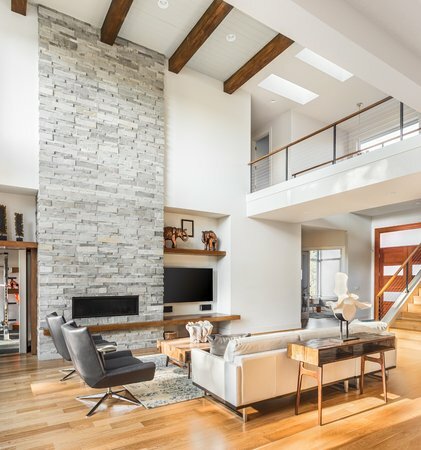 If you are looking to incorporate mid-century modern design into your home, remember these four guidelines to make sure you do not stay out of the style. This modern style design theme has lasted so long because of its functionality. Modern designed rooms, architecturally and decoratively, thrive off accentuating an open floor plan. They allow for large windows and the openness of the space to help enhance the atmosphere while using lighting to improve the space’s overall feel. Open floor plans will always make a room feel less cluttered and more inviting. The modern design will also include furniture with a simple yet innovative way of expressing itself. Borrowing the influence from Scandinavian and Brazilian design styles, mid-century modern eliminates bulky furniture and any object that is unnecessary to the functionality of the room. With a minimalist approach, mid-century design pulls balance from sleek lines and less formal yet simple furniture. Sleek lines are utilized through the design to target easy maneuverability and free-range of sight. This sleek approach will allow you to focus on modernizing your space. Whether you stay with a neutral palette or go with a more vibrant palette, both are now accepted in mid-century design. Mid-century modern also will have a certain elegance to it by amplifying the openness of the room with a minimalist approach. This clean atmosphere is one of the many reasons this style is highly sought after by home buyers and designers. An open, sleek room will always feel bigger with selective furniture and less untidiness. Paying attention to \having a purpose or function in the room ultimately pioneered the movement for minimalism. Overall, simplicity encapsulates the mid-century modern’s whole style. Paying close attention to what is in the room and keeping it clean is part of the maintenance, but the simplicity of the design really makes the style so desirable. While straying from unnecessary furniture, you may want to add furniture of all different family of material. Include plastics, metals, woods, and glasses into your room to make a bold statement. With modernism and the juxtaposition of mixing unorthodox materials into a single room, mid-century design will continue to evolve and stay with us. While most trends come and go, modern design has become an ever-growing style that does not seem to be slowing down soon. Consider adding this style of design to your space to help open your atmosphere and highlight the functionality of your room. Have questions? Contact our team today.